Anyway, in anticipation of all that, I've been food-inspired lately. Opening favorite old cookbooks to find new things, and finding new cookbooks to put a spin on the old. 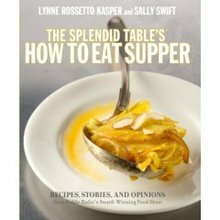 One new arrival has been The Splendid Table's How to Eat Supper: Recipes, Stories, and Opinions from Public Radio's Award Winning Food Show. Amy shared a great review of it a few weeks back, and everything she said is so very true. I love the stories woven into the recipes. And the recipes are delicious, and well, 'different' than so very many other cookbooks. It feels like a 'fresh' cookbook if that makes sense. I've actually photographed a bunch of the things we've made from this book in the past month, but this is the only one that I don't fear will have the effect of turning you away from the book. A food photographer, I am not (Delicious photos in the book - I'll leave it to the experts). 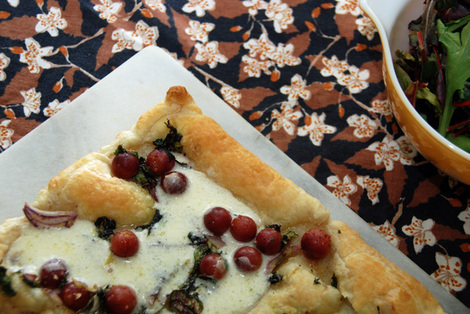 Above is the Supper Tart of Red Onions, Greens and Grapes. See what I mean? "Different" - we make SOOO much pizza around here, and this was a perfect fresh spin on it for us - on puff pastry (I know, it's a tart, not a pizza, but the kids thought it was pizza). It was so good that looking at this photo is totally motivating me to make it again (for the fourth time) tonight. Yum. Another favorite has been Sweet Roasted Butternut Squash and Greens over Bow Tie Pasta. Again, just the right spin of yummy and new. Oh gosh, and the Retro Garlic Bread! Really good too. Of course, I wanted to listen to the radio show after falling in love with the cookbook. And thank goodness for the internet (it's not carried on my local radio station), because you can listen to podcasts of the show on their website. 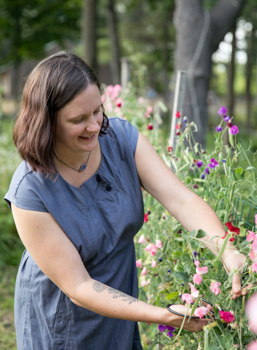 (They've also got a really interesting year-long project going on, following 15 people eating a regional diet, each blogging about the experience - Locavore Nation). As a little treat for YOU, the publisher, Clarkson Potter, has generously agreed to do a giveaway of The Splendid Table's new cookbook. All you need to do is leave a comment on this post before 7am (my time) tomorrow - Friday - at which point I'll choose a random number to send one copy of the book to, and announce it here at the end of this post. Good luck! I'd love some new recipe ideas!! We live in PA in Amish country...where a lot of the meals I make are meat and potatoe AND basic. I'd love to have some new ideas!! Congratulations! And thanks to everyone for playing!